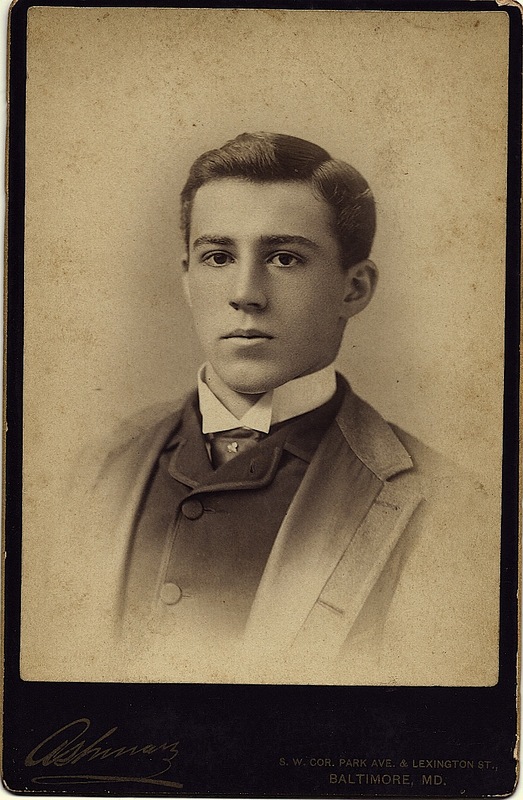 Baltimore photographer William Ashman (1863-1902) took this cabinet card portrait identified in period ink on the reverse as Frank Ryland Steel (b. abt. 1867, Virginia), DDS. Steel may have sat for this photograph upon the occasion of his graduation from the Dental Department of the University of Maryland in March 1888. After completing his studies, Frank followed his father, George B. Steel (1835-1916), and his half-brother Charles Lowndes Steel (1860-1904) into the family dental practice in Richmond, Virginia. Charles had also studied in Baltimore–earning his DDS from the Baltimore College of Dental Surgery in 1881. Frank got his middle name from his mother, Martha “Mattie” Ryland Fleet (1839-1871). His father married three times in all, so the Steel household was a large one. All told, there were 12 siblings and half-siblings. Frank Ryland Steel married a much younger woman, Dora Robertson, in 1924; it appears they had no children, and by 1930 he was a widower, living alone in the small tidewater town of Urbanna, Virginia. I have not been able to trace the Steels back beyond the census of 1860. Frank’s father George B. Steel was active in Richmond politics, and a 1911 campaign advertisement says only that George B. Steel’s father was “George Steel, a former merchant of this city” (Richmond Times Dispatch, 16 September 1911). However ordinary his life appears, someone cared enough about Frank Ryland Steel to keep his portrait in their collection of dentists all these years.